The programme to re-body carriages continues. Last year old carriage 119 was replaced by a new super saloon and shortly we will have 117 in service with its new body too. The new vehicle, whilst continuing the house style associated with the FR Barns of the 1960s, are designed and built to a much higher standard. They feature superior seat spacing, double glazing, efficient heating, better handrails and steps, wide doors and increased luggage capacity. They are designed with passengers’ needs in mind, including those with more luggage, buggies and special access needs. Once a vehicle has gone through the re-bodying program we are left with a steel body shell without bogies or brake gear. The interior fitting rotations have been planned such that the best seats from these vehicles are moved to those still in service. What is left is a body with fairly worn seats. This of course leave us with a problem as to how to deal with storing something that has been part of our recent history but currently has no use on the railway nor is it possible to use them as they have no running gear and we have nowhere to store them. Rather than scrap them the best solution is to sell them to other railways. We have been fortunate in finding two railways in the UK each wanting to take these bodies, refurbish them and put them on bogies in their possession. In each case the railways have a short running line to which these carriages are well suited. In due course 118 and 120 will follow 117 and 119 to these new homes. This means that these vehicles will not be lost and will continue to bring pleasure to passengers for many years to come. Some time ago, carriage 121 was converted to service vehicle 124. 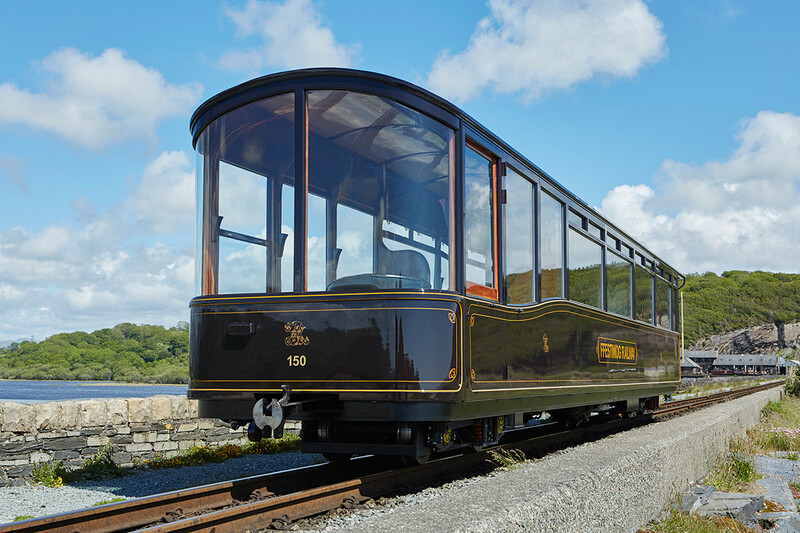 Carriage 110, the first of the steel-bodied carriages, has been earmarked for preservation and will be retained in traffic for the foreseeable future. In the case of carriage 116, an earlier vehicle with aluminium body sides, this has been modified to have its first class compartment removed and its windows changed such that seat spacing akin to the newer vehicles is possible. It too should see service for quite some time yet. Carriage 111, the observation car with a driving compartment from push-pull days is to be transferred to departmental service complete with its current bogies. This vehicle offers only 11 first class seats and has part of the rearward view obscured by the driving compartment. Like 117-120 it is not easily modified due to the nature of its construction. It is replaced by Pullman observation car 150 (below) which has new pair of bogies allocated to it. The three Carnforth carriages 112-114 will continue in service for some time yet and the original barns will be carefully considered for minor modifications when they come due for overhaul with a view to improving some of the problem areas associated with them.